Foraging activity in social insects should be regulated by colony nutritional status and food availability, such that both the emission of, and response to, recruitment signals depend on current conditions. Using fully automatic radio-frequency identification (RFID) technology to follow the foraging activity of tagged bumblebees (Bombus terrestris) during 16,000 foraging bouts, we tested whether the cue provided by stored food (the number of full honeypots) could modulate the response of workers to the recruitment pheromone signal. Artificial foraging pheromones were applied to colonies with varied levels of food reserves. The response to recruitment pheromones was stronger in colonies with low food, resulting in more workers becoming active and more foraging bouts being performed. 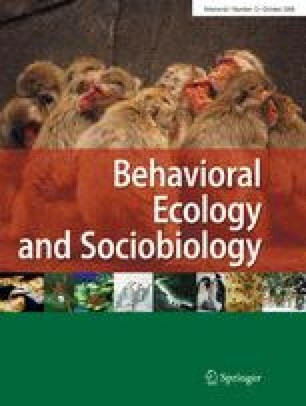 In addition to previous reports showing that in colonies with low food successful foragers perform more excited runs during which they release recruitment pheromone and inactive workers are more prone to leave the nest following nectar influx, our results indicate that evolution has shaped a third pathway that modulates bumblebee foraging activity, thus preventing needless energy expenditure and exposure to risk when food stores are already high. This new feedback loop is intriguing since it involves context-dependent response to a signal. It highlights the integration of information from both forager-released pheromones (signal) and nutritional status (cue) that occurs within individual workers before making the decision to start foraging. Our results support the emerging view that responses to pheromones may be less hardwired than commonly acknowledged. The online version of this article (doi: 10.1007/s00265-008-0623-3) contains supplementary material, which is available to authorized users. We would like to thank Syngenta Bioline Bees for supplying bumblebee colonies, Oscar Ramos Rodriguez for help with experiments and colony maintenance, and three anonymous referees for useful comments. This work was supported by a grant from the Natural Environment Research Council (NE/F523342/1). The experiments comply with the current laws of the country in which they were performed.